We were awarded Best of South Shore 2014 once again by the Tampa Tribune. :) Thank you to everyone. What an honor! Today starts our 50% off all pizzas ordered online. This deal never last very long so take advantage of it. It's good for carryout or delivery. Only catch is no other discounts such as our "carryout special" can be combined with it. Happy Thanksgiving to everyone! Please remember our soldiers who have not made it home for Thanksgiving this year. They and their families deserve a special thanks today. Thank you! Happy Veterans Day to all those who have served our nation in uniform for their service, sacrifice and love of country. THANK YOU for protecting our life and liberty so that we may all pursue happiness. We are please to announce we now have Chocolate lava cakes, Apple Blossoms, and Reese's Peanut Butter Cup Cookies. Don't forget to complete your meal with one of our delicious desserts. Coming Wednesday evening we hopefully will be introducing several great dessert items. Chocolate Lava Cakes, Decadent Reese's Peanut Butter Cookies, Decadent Smores Cookies, and an Apple Blossom. We will be sure to update our website and facebook pages as soon as these are ready. It doesn't have to be of your house but it does need to be in South Shore. Please tag the address of the house. We'll pic the photo we like best and give the poster a free large pizza for pickup. We'll pick the winner 11/2/13. The house must be located in either Ruskin, Apollo Beach, Sun City, Sun City Center, or Wimauma to be eligible. Please keep it family friendly! Last week we launched our Pizza Rewards! Every time you place an order online you accrue points. You can then redeem those points at checkout on any future orders to receive a discounted price. You can let them accumulate over a period and redeem them all at once or you can redeem them each time you order. The choice is yours. You may also use them in combination with a coupon to save even more money. You need not do anything to enroll. Just simply order pizzas online and watch the point accumulate. We are already seeing some customers redeem there points and saving money. You can find more information here. Lately a whole bunch of phone calls have been inquiring where we deliver. So here is a list of towns: Apollo Beach, Sun City, Sun City Center, Ruskin, Wimauma. So basically if you live on Big Bend Rd or south to the Manatee River off US 301 or Cockroach Bay Rd on US 41 we deliver to you. I'm starting to get better at writing code for our website. Today I was able to update our online ordering system so you don't have long pages. Everything will pretty much fit on the viewable page. I was also able to shrink the file size of most of our pictures. Both of these changes should result in a faster experience! Today the Tampa Tribune honored us! Best of 2013 came out today for South Shore. South Shore is the area that includes Ruskin, Apollo Beach, Riverview, Sun City Center, Gibsonton, Wimauma, and surrounding communities. We had the honor of placing second in the pizza category. Second! Wow! After being open for just over a year the community thought we had the second best pizza in the entire area! How blessed we are! However we see it as even better news! The first place winner has been open almost 10 years and doesn't deliver. The 3rd place winner has been open well over 10 years and doesn't deliver either. That means that hands down we DO have the best pizza delivered in South Shore! We are so honored to have just been nominated let alone place second. We thank all of our loyal customers and employees that have made this possible! Once again thank you! We are honored! 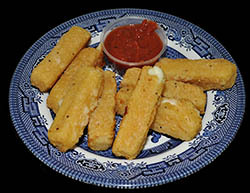 Today we have added Cheese Sticks to the menu. Warm, melty Mozzarella cheese covered in Italian bread crumbs and baked to a crispy golden brown. Perfect for dipping in marinara sauce. Today we added cheese fries to the menu. These fries come in an 8" pizza box. We cover them in cheddar cheese and top them with bacon. Served with either ranch or parmesan peppercorn dipping sauce. Happy Mother's Day! Treat you Mom to a day off from having to cook and clean. Let us do it for you. We have pizza, pasta, subs, wings, calzones, salads, apple pie, chocolate overload tortes, oreo mousse pie, fresh baked cookies. We have a little of everything and we deliver. So you don't even have to leave home. Just give us a call 235-1000 and we'll do the rest. We are pleased to announce our line of pasta! We have 5 varieties to choose from. Alfredo which has chicken and alfredo sauce. A Chicken carbonara which has grilled chicken, bacon, fresh onions and mushrooms, and alfredo sauce. An Italian sausage marinara which is marinara sauce, italian sausage and topped with mozzarella cheese. Primavera which is topped with fresh baby spinach, diced tomatoes, fresh mushrooms and fresh onions then smothered in alfredo sauce. Macaroni and Cheese we smoother it in cheese and lightly sprinkle bacon on top before baking. Individual sizes are served in a breadbowl while the family size comes in a 9" round tray. $3.99 cheese or pepperoni pizza has arrived. Just in time for the dreaded tax season. We offer you a little relief. Our hot and ready pizzas are just $3.99 for a 12" cheese or pepperoni pizza. Hurry and take advantage of this deal as it won't last forever. Prices this cheap are hard to come by for a pizza smoothered in cheese and loaded with pepperoni. No skimpy pizzas here! Today we hired Garret as a delivery driver. That makes 4 new drivers in just the last 10 days. Let's keep them busy and this trend continuing! Today we hired Noel back. He worked for us when we first opened up as part of the staff that remained from the old company. We are excited to have him back on our driving staff. We have added a new product. We are now selling banana bread as a dessert. Of course you could order it as a meal, side item, snack, or for tomorrow's dinner. It is really good! It is a half pound loaf of banana bread and only $2.50. This is an item that we bake fresh in our store so quantities are limited to ensure freshness but if you know you will need several give us some notice and we will bake some just for you. So now we are baking chocolate chip cookies, macadamian white chocolate chip cookies, and banana bread fresh in our store. Today we hired Mike and Dan as our new delivery drivers. This should help some of our growing pains and help us stay caught up on delivering pizzas within 30 minutes. Hopefully we will add another driver or two in the next week. Boy Scout Troop 661 stopped by tonight to bake 600 loaves of banana bread. This has to be the best tasting banana bread in town! I'm not kidding. They started after we closed at 11pm. Somehow they managed to make from scratch all 600 loaves and bake them in less than 4 hours. If I hadn't seen it I wouldn't have believed it possible. Many thanks to all those who helped out and to all those who bought bread and supported them. If you'd like some banana bread call us or email us and let us know. We can probably get you some for the next couple days. We'd especially like to thank them for leaving the place so clean. Happy Valentine's Day everyone! We sure have felt loved over the last year! Many thanks to all of you. Here is a fun pizza/valentine's day video for you to enjoy. Online ordering website received a much needed facelift. Gone is the tan and maroon colors. In with the bright, vivid, bold colors. If you've tried our food you know it stands out way above the others. We needed a website that stood out just as much. We updated our cover photo and profile photo on facebook. It now more inline with our goal to sell pizza, wings, sub sandwiches, calzones, salads, desserts through online ordering or phone orders and represents our carryout/pickup or delivery service. We finished and installed our new website theme today. Hopefully everyone likes the changes. We think it is fun and easier to view. We added pictures of our pizzas, sub sandwiches, wings, and desserts to the main page. I don't know why they weren't there in the first place. We are after all a carryout or delivery pizza and sub shop. Major online ordering upgrade made today. The site is faster and more secure. Additionally our checkout used to be 3 pages. It is now just 1 page long. There is also 30% less information needed to be typed to create a new account. But we still have more things planned. Boy did we have a great Super Bowl. I sure hope you ordered your food from us. We had deliveries in less than 30 minutes all night long thanks to some great planning. Great product, great service, and great sales means a win win for us. We didn't get to watch the game with all the orders but we heard the 49er's pulled the plug on the lights so they could try to regroup. Go Daddy.com There is kissing in this one. We have started giving our website a facelift to match our newer uniforms. These changes will slowly start taking place as I can get them made. We hope you like the new look. We are looking forward to a great weekend! The Super Bowl is here and lots of great commercials are sure to be run. We have created many specials for your superbowl party. Offering discounts on anywhere from 2-8pizzas. If you need more no problem. Just give us a call and we'll work it out for you. you can find all our Super Bowl specials here. Sign up for ouremail newsletter so you don't miss out again. We have even added a larger 50 piece order of wings for just $25.00! So who do you think will win this year's Super Bowl? After being asked all last year for ready to go pizzas we are happy to announce HOT AND READY PIZZAS just $5. Choose from Pepperoni or Cheese pizza. Just walk in and ask for a Hot and ready cheese or pepperoni pizza. We have some ready at all times now. No need to call ahead or wait. 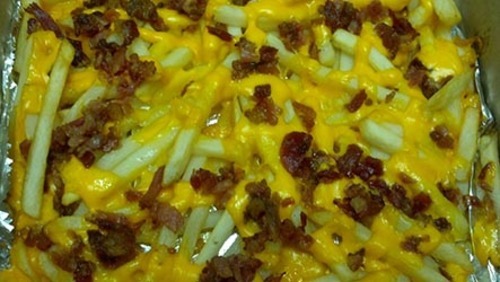 If you want one made to order of course we have our large 2 topping $7.99 carryout special still. New shirts and hats have arrived. They are black with yellow. We will start transitioning into these colors soon. So don't worry if we show up at your house and don't have the red with black. These new colors are bolder and brighter. Hopefully they will be easier to read from a distance. We are starting the new year off right it looks like. Sales are way up tonight! May this success continue throughout the new year! Happy New Year! We celebrate our 1 year anniversary. Many thanks to you our customers who have kept us going and supported us during our first year. Thank you!! We expanded our dessert menu. We now have Strawberry Cheesecake and freshly baked cookies. We carry Chocolate Chip and Macadamia White Chocolate Chip Cookies. They are absolutely delicious and a perfect addition to our sub sandwiches. Our new redesigned website is up and active. We are so excited! September has been our month of major website upgrades. We hope you like them. They are easier to navigate and view on computers and smartphones! Our new online ordering site went live at http://onlineorder.sshorepizza.com. This was a huge step forward. Easier navigation, smartphone friendly, coupons are accepted, credit card payment will be available soon. It is hosted on our own domain so we have more control to make changes and keeping it up and running all the time. School has officially started. We will miss our regular lunch crowd that is now back in school. We do have specials for the schools so if you need something delivered to the school or church just call and ask for their special pricing. School is coming to a close for the year. Tons of teachers are having parties to celebrate student accomplishments. Thank you to all the teachers for their hard work educating our future generations! After many of you asking for it and a whole lot of searching we launched a web ordering site(not our current one). It was a big step for us to launch a website and online ordering. We participated in Ruskin's first annual Wing Fest at EG Simmon's park. It was a great day of meeting our customer's and hearing great feedback from the community. We didn't win first place but had a blast. What a fun time! We look forward to winning the 2nd Annual Wing Fest next year. South Shore Pizza opens for business in the old Domino's Pizza location. We retained the staff of the Domino's Pizza so no one lost their job as a result of the closure of Domino's Pizza.